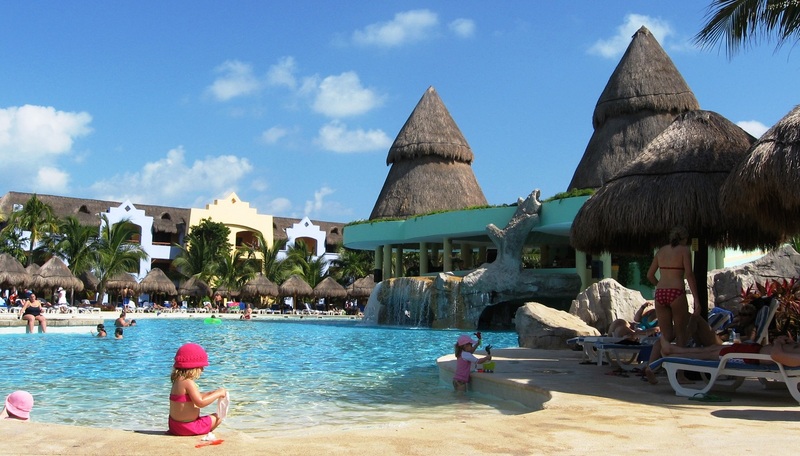 Iberostar Paraíso Maya embraces local customs and culture to offer a 5-star all-inclusive family-friendly experience. Traditional local Mayan culture influences the decor, food and fun at Iberostar Paraíso Maya. Visit the El Tapatio restaurant to sample authentic Mexican cuisine. Admire many of the furnishings around the resort that are constructed using local limestone and wood. Or stop by the lobby bar where in addition to authentic Mayan ruins there is a reproduction of the world-famous Chichen-Itza pyramid. Centrally located on the Riviera Maya, the resort caters to the whole family with large suites, clubs for kids and teens, a lazy river, wave pool and a variety of activities in and out of the water. A home away from home awaits with large, luxurious suites full of amenities and perks including a stocked mini-bar, television with DVD player, hydromassage in the bathrooms, a balcony with a view of the garden, jungle or pool, air conditioner, in-room safe, sofa, hair dryer, iron and coffee service. There are a dizzying amount of places to eat and drink at Iberostar Paraíso Maya. Several buffets give you the opportunity to sample both International and regional cuisine. The a la carte restaurants deliver gourmet tastes like Japanese, French, Cajun, Mexican and American. The hotel requests all guests comply with the dress code at certain restaurants. After dinner, enjoy the nightly live musical performances and variety shows. Or teens and adults can each retreat to their own discos to hang out and relax. The 17 bars and nightclubs at the resort serve up Mexican beers, specialty cocktails and delicious mixed drinks. Unwind after a day of activities or laying in the sun with a visit to the Iberostar Paraíso Maya spa. Sign up for a massage, facial, body treatment or relax in the jacuzzi. Kids ages 4-12 can hang out with their friends or make new ones at Lucy’s Club. Together they can watch movies, play games or participate in arts and crafts sessions. From food and flowers to location and music, a wedding coordinator is ready to assist you in planning and producing the wedding of your dreams. Contact us for details. Within the Playa Paraíso resort complex is an 18-hole golf course designed for amateurs and pros alike. Practice your skills on the putting green before playing a full round. Need help planning a golf getaway? Just get in touch, we are happy to help. From business meetings to gala dinners Iberostar Paraíso Maya has the facilities, space, equipment and expertise to help your event go off without a hitch. Contact us for more details and a personalized group quote. There is no shortage of activities to keep the whole family engaged and entertained during your stay.